Ohio State (15-21, 4-8) has been on the road for a while. It’s had some midweek home games mixed in there, but the past two weekend series have been on the road for the Buckeyes. Now OSU is getting a chance to enjoy some home cooking with its second nine-game homestand of the season, which will kick off on Wednesday with a matchup against the Northern Kentucky Norse (12-22, 6-6 Horizon League). The Buckeyes found little success the last time they played nine consecutive home games, amassing a 4-5 record and a 1-4 record in conference games. The Norse have had a rough time getting things going this season, compiling a 12-22 record that includes an abysmal 6-19 road record. The one thing that has gone well for the Norse this year has been their ability to produce at the plate. As a team, they are batting .275 with 36 home runs so far this season, including a pair of hitters with eight home runs and four regulars batting above .300. The team has scored a total of 211 runs, averaging 6.21 runs per game. Its star bat this season has been junior first baseman and pitcher Trey Ganns. Ganns has eight home runs, while his .310 batting average is sitting as the team’s second-highest among starters. Ganns, the team’s cleanup hitter, has demonstrated an acute ability to clean up the bases, leading the Norse with 32 RBIs this season. Scoring runs has not been an issue for the team. Rather, the issue has been keeping the opponents from scoring runs of their own. Across 287.2 innings the season, the Norse have posted a team ERA of 6.41, which ranks 260th out of 295 Division I programs. Pitchers have struggled to limit contact, having surrendered 364 hits this season (.370 opponents’ average). 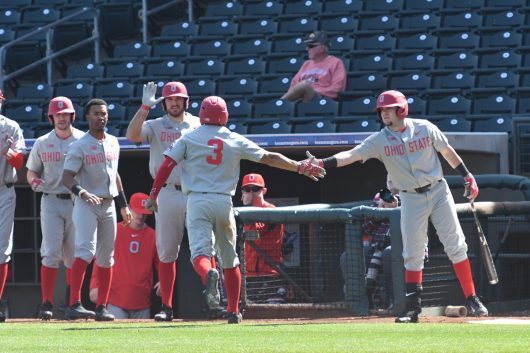 The Buckeyes’ inability to keep the bats going for extended periods of time has been cited by coach Greg Beals as the chief issue for the team. After the team took two of three against Penn State with a combined 16 runs over the final two games of that series, the OSU offense mustered just two combined runs against a pair of midweek opponents in Cincinnati and Eastern Michigan, and was shut out by Michigan State in its first of the three games in the past weekend’s series. Though his team has shown a lot of signs of struggle, Beals said he believes the talent is there for his team to start putting it all together, and he hopes his bats can click in opportune moments. The Buckeyes hope to get that offense going again when they take on Northern Kentucky on Wednesday with first pitch scheduled for 6:35 p.m.